You notice that people from India are poking around your workplace—and their numbers are growing. It is time to smell the coffee and realize that you and your coworkers are about to get the H-1Boot. Time and again we hear of situations where entire IT departments are laid off, outsourced, and in many cases forced to train their replacements. In this article, John Miano, attorney, tech worker, and author of the book SOLD OUT has this advice should you find yourself in this predicament. Exchange contact information with your coworkers. Exchanges names, home phone numbers, home emails, and addresses of everyone likely to be affected. Do this while you are all together. Once you get fired, this information is hard to gather. The better organized you are, the better the case you can build. The better the case, the easier it is to find a lawyer. If there are 200 of you potentially willing to be plaintiffs, the potential legal fees are 100 times greater than if there are just two of you for essentially the same amount of work. Do not sign anything without having a lawyer review it. Contact a union then start formal organizing. You have nothing to lose once the offshoring companies start showing up. Create an organization chart for the company. You don’t need to cover the entire company but be sure it includes the managers of affected groups and everyone up to the CEO and any HR people involved. Try to find out where they live (nothing will make your CIO the hit of his neighborhood like having 300 people protesting on his street). For each foreign worker that shows up, document the date of arrival and try to identify the worker’s name, employer, nationality, and visa type (e.g., B, L, H-1B). Save all memos related to the foreign workers. Look for any Labor Condition Applications for H-1B workers and make copies. These should be displayed in a public place in the office. When managers make verbal statements, write down what you heard, what you were supposed to do, and what your reaction to the statements was. Include the date. You want to have as much information as possible about context to help make the statements admissible as evidence. If it is legal in your state, record the conversations. Recording the reaction to what your employer said is just as important is recording what was said. You need to overcome the problem of hearsay. Hearsay is an out of court statement made to prove the truth of the matter asserted in the statement. However, there are many ways to get around the hearsay problem. Imagine you are on the witness stand. Mr. Green’s statement is not hearsay, when it is used to prove something else. In this case, why you thought you would lose your job. It is likely your employer will expect you to train your replacements. If you are organized and all of you say NO together the outsourcing plan will go down in flames. Even if you cannot get that organized, provide the least information to the replacements. Tell your local newspapers and television stations what is happening. Let them generate some bad publicity for your Quisling employer. 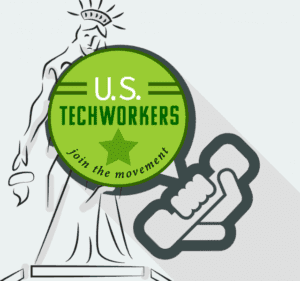 In closing, twice in the last two months, we here at US Techworkers became aware of outsourcing by third-party firms utilizing H-1B visa workers and in both situations, the employees being fired did none of the above. With only one or two exceptions they signed their paperwork, trained their replacements and received the paltry severance packages that would keep them afloat for several months to a year. DO NOT LET THIS HAPPEN TO YOU! Follow John Miano’s advice and fight back!